The achievement yesterday was to walk from the Bridgewater Bridge to the New Norfolk bridge on the western shore of the Derwent River. 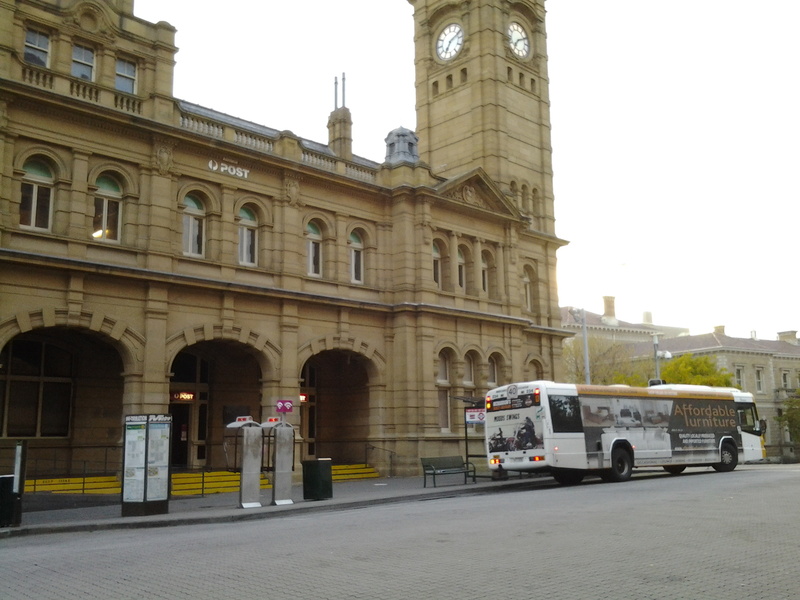 I set off from home before the sun was up and I found Hobart was quiet when I arrived at the city bus mall. 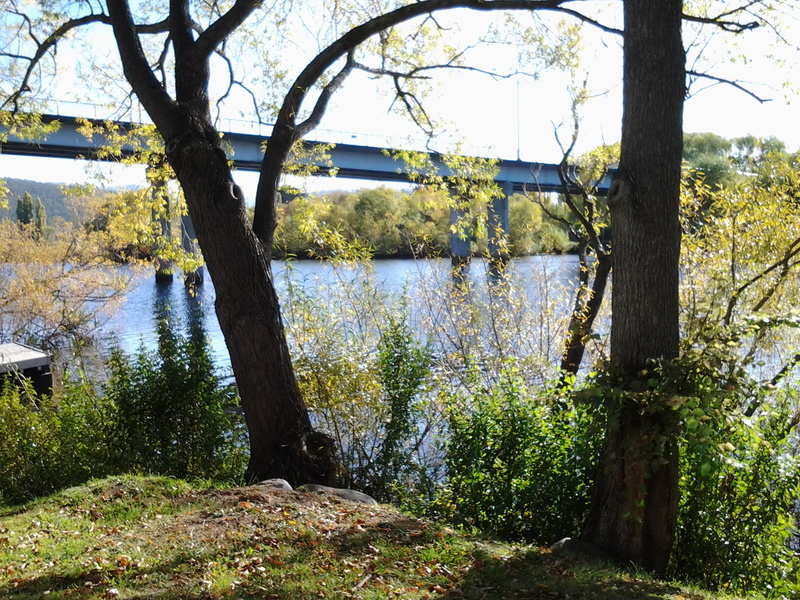 Then I bussed to Granton and alighted from the bus at the intersection with the Bridgewater Bridge causeway. From Granton I walked north-west then west towards the inland town of New Norfolk walking mostly along the Lyell Highway and then on a walking track for the last 5 or so kilometres. The morning was freezing and the afternoon warm. 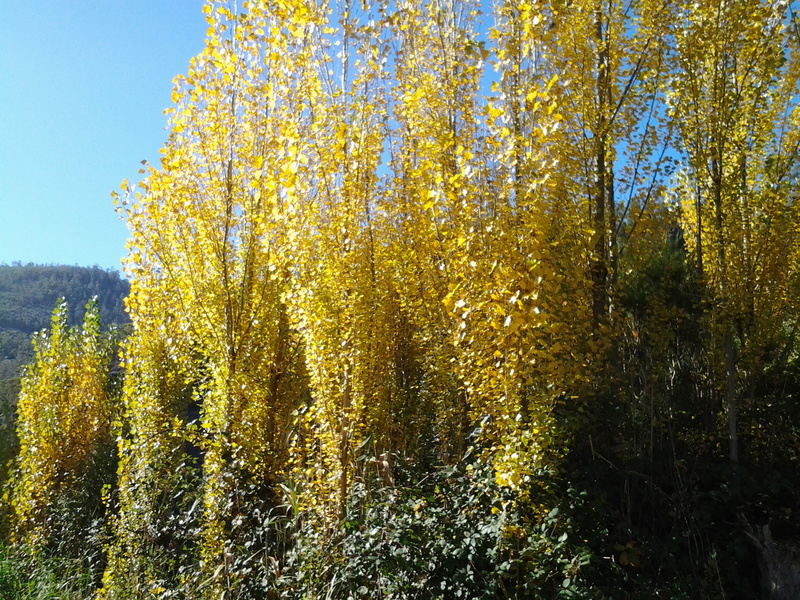 But the sun was out; its hard autumn light made the world seem alive and sparkling. 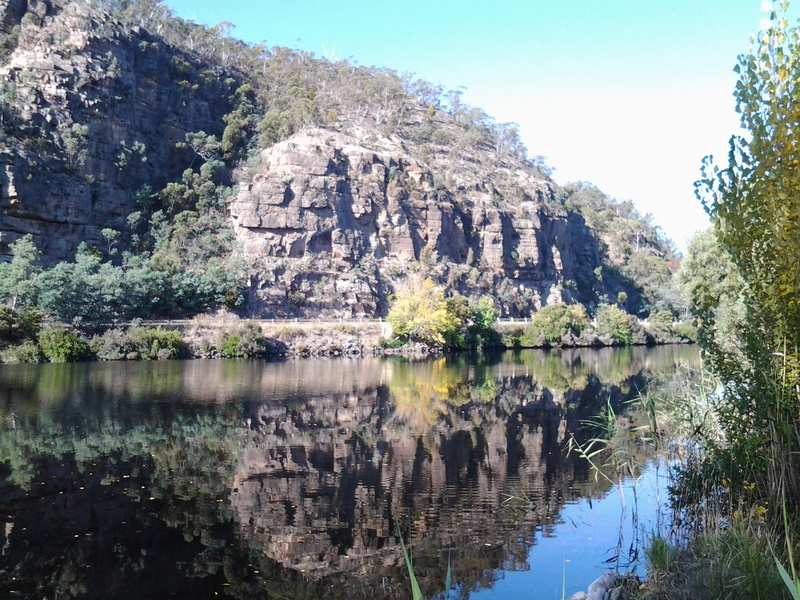 The Derwent River was splendid, often still and reflecting the trees and hills on its surface, under a bright blue sky with the sun shining gloriously. I finished my walk at the bridge crossing the Derwent River in New Norfolk. During the walk, I covered about 15½km of the length of the Derwent River. By my reckoning, the total distance of the Derwent River on the western shore from the mouth of the River to New Norfolk is 54¼ km. My walking distance was approximately 20¼kms. I have now walked approximately 191¼ kms not counting getting to and from buses, as part of this project to walk along the Derwent River. The highlights of the walk to New Norfolk were finding the remnants of two clearly visible heritage lime kilns, seeing a family of 6 pelicans, finding the track along the river leading to New Norfolk, and being mesmerised by the spectacular autumn foliage along the walk and especially in New Norfolk. I started walking from Granton around 8am and, despite wearing a thick woollen beanie plus a thermal top under my windproof jacket, I was frozen for the first two and a half hours. It was 8 degrees Celsius at Bellerive when I left home, 6 degrees at Glenorchy and I suspect much less with a wind chill factor along the first part of the walk. On this basis, I will not be walking further inland until sometime in Spring, and the timing of starting again towards Lake St Clair will depend on the air temperature. Over the coming week I plan to enjoy writing up the journey and the discoveries of Stage 14’s walk in a series of different postings. 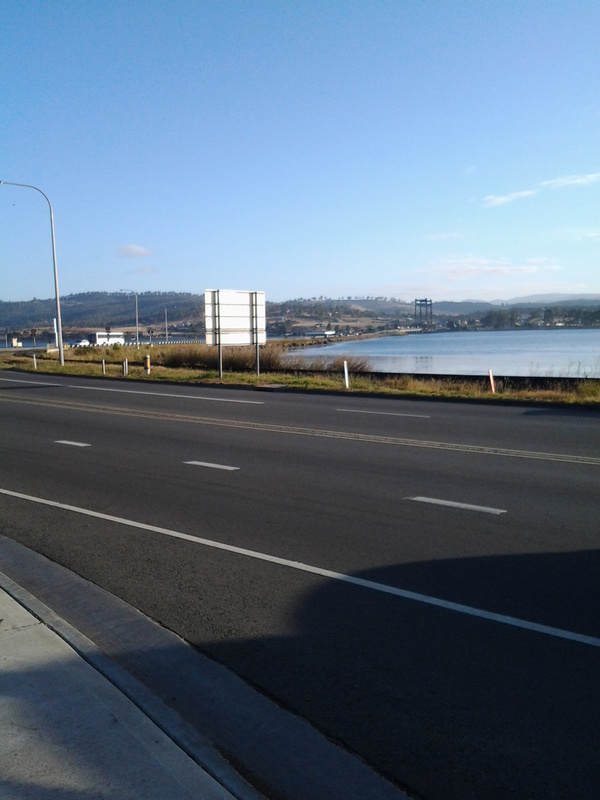 This entry was posted in Derwent River, Hobart, Tasmania, Walking and tagged autumn, Bellerive, Bridgewater, Bridgewater Bridge, bus mall, Causeway, City of Glenorchy, foliage, Granton, heritage, highlights, Hobart, Lake St Clair, lime kilns, Lyell Highway, mouth, New Norfolk, Pelicans, Stage 14, sun, track, walking distance, western shore, wind on April 14, 2015 by Tasmanian traveller. Well done! Very brave to tackle the walk in our chilly autumn weather. That would have been your longest walk (in one go) to date, wouldn’t it? Thanks. Yes it was the longest walk to date. I have just updated the information under “Useful Additional Information/How far have I walked” on the blog and can see the longest walk previously was on Stage 10 (MONA in Berriedale to the centre of Hobart) when I walked about 19km. As for yesterday’s temperature, I thought it would warm up quickly and … I forgot to think of wind chill. Silly me! You are correct. It was a vessel named “New Norfolk”: a trans-Derwent punt which was swamped and sank while in mid-stream at New Norfolk, 17 July 1831. No loss of life. There are a whole crowd of other boats, ferries and ships which have connections with New Norfolk but which sank or were scuttled elsewhere in Tasmania. As we were driving up to Launceston last month, we wondered how you would tackle this stage of the walk and what your strategy would be. I don’t think your hypothesis was too far off! Good on ya for taking it on in the cooler weather. Fancy that. You considering how I would go when you had so many other things to think about. I hope you will enjoy the descriptions as I ‘take’ you on the walk over the coming postings – at the rate of probably one a day – so you can feel what it was like and ‘see’ what I saw along the way to New Norfolk. You do discover so much while walking would have been so cool to see the family of pelicans I did not aware that Australia got this cool, but I imagine Tasmania might have it’s own microclimate, separate from mainland Australia. These are temperatures we would get in the early part of Canadian autumn. Can understand why the journey will be continued come spring. It was a shame that the pelicans were feeding on the other side of the river, because being so far off my photos could only indicate white specks. Alas. But they are in my memory. Australia is so big and covers all the temperature and climate types of the world – from the tropics to the dry deserts to snow covered highlands and everything in between. 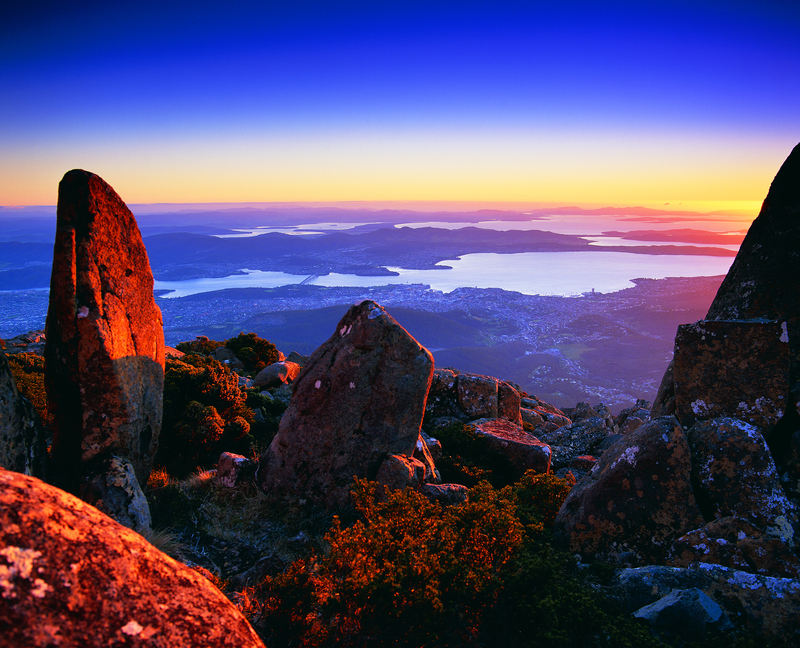 Because Tasmania is an island, generally the coastal areas have moderate winters but the lake and wilderness interior seems to hold the full fury of the westerly winds that have flown over the seas from South Africa. Routinely there is one inland town that we know has lots of minus 10 and 11 degrees (Celsius) each year. But this isn’t typical of most of Tasmania. Of course, such a temperature is not as cold as that which occurs in winter in much of North America, northern Europe and the top of Russia. Personally I prefer a 18 degree day for walking and a 24 degree day for living. But there is nowhere in the world which offers this reliably for 365 days a year so I suffer through the winter. At Bellerive there will be some mornings at 0 degrees, and unfortunately some days will only reach 8 degrees as the maximum. None of this suits me. Hobart is the driest of all the capital cities in our Australian states even though it is the southern most capital city. What this means is that mostly when it is cold, the sky is blue, the air sparkles with cold sunlight and the world does look beautiful.